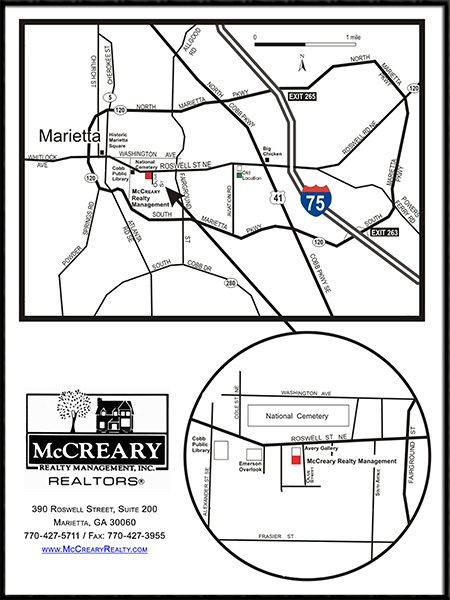 Contact Us - McCreary Realty Management, Inc.
We hope it was able to assist you with your real estate management needs. If you have questions or comments, please feel free to contact us. You may contact any staff member by email, by navigating to the McCreary Professional page and clicking directly on the staff member’s email address. Head west on Roswell Street and go through 4 traffic lights and over Fairground Street. 390 Roswell Street will be on your left directly across the street from the National Cemetery. We are the 2nd story of the Avery Gallery building. Turn left on Olive Street and immediately right into the parking lot at our front door. Head east on Roswell Street leaving South Park Square. Go thru 3 quick traffic lights, past the Cobb Main Public Library, Emerson Overlook and Cobb Hardware to the 2nd story of the Avery Gallery building. Turn right onto Olive Street and immediately right into the parking lot at our front door. Follow 1-75 North to Exit 263-West, South Marietta Parkway; Exit Right but stay in the left exit lane. Follow under the bridge and loop around to head West on the South Marietta Parkway (GA Loop 120}. Follow across Cobb Parkway and continue to Fairground Street. Turn Right and follow to Roswell Street. Turn Left and follow to 390 Roswell Street, which will be on your left directly across the street from the National Cemetery. We are the 2nd story of the Avery Gallery building. Turn left on Olive Street and immediately right into the parking lot at our front door. Follow 1-75 South to Exit 265, North Marietta Parkway. Take exit and turn right onto the North Marietta Parkway. Follow across Cobb Parkway to Fairground Street. Turn left and follow to Roswell Street. Turn right and follow to 390 Roswell Street, which will be on your left directly across the street from the National Cemetery. We are the 2nd story of the Avery Gallery building. Turn left on Olive Street and immediately right into the parking lot at our front door.